North St. Paul senior Mitchell Whyte set a state record in the 100-yard backstroke on Friday in the preliminaries of Class 2A state swimming meet at the Jean K. Freeman Aquatic Center. Whyte swam the event in 48.10 seconds and broke the record, set last year by Chanhassen senior Jack Dahlgren, by .18 seconds. Dahlgren took second in the prelims with a time of 48.76 seconds in the ensuing heat. “I didn’t think I was going to go that fast, but it definitely felt great,” Whyte said. He predicted he would have to swim a faster time Saturday to win the event and that Dahlgren would be ready to swim fast. Dahlgren said Whyte’s swim motivated him and that he’ll have to prove himself again Saturday. He said he wasn’t shaved and wasn’t in his top suit Friday, adding that he has room for improvement. 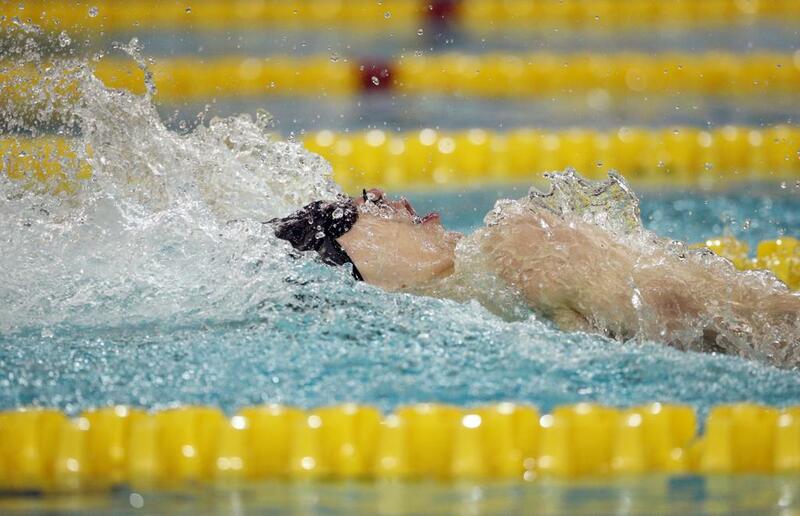 “There’s just some small things I can improve on and then just swim my heart out [Saturday],” he said. Dahlgren also placed first in the 200 freestyle prelims with a time of 1:38.11, which was over two seconds faster than his closest competitor. He was also part of the 200 medley relay team that took first in the prelims and the 400 free relay team that took second. Minnetonka is well-positioned to compete for a second consecutive state title after the preliminary round, led by seniors John Shelstad and Erik Gessner. Shelstad took first in the 200 IM and third in the 100 butterfly, and Gessner took first in the 100 butterfly and third in the 100 backstroke. Lakeville North junior Andrew Trepanier took first in both the 50 free and the 100 free. St. Louis Park freshman Hayden Zheng took first in the preliminaries of the 100 breaststroke with a time of 56.60 seconds. Zheng said he was extremely happy with his time, adding that he feels confident going into Saturday’s finals. Breck/Blake coach Kris Rosenberg said his team isn’t focused on winning trophies. On Friday, Breck/Blake put on a nearly flawless performance in the preliminaries of the Class 1A meet. Breck/Blake opened defense of its Class 1A title by advancing all three relay teams and 15 individuals to Saturday’s championship finals. One junior who stood out in the preliminaries for Breck/Blake was Anderson Breazeale, who had the top qualifying time in the 200-yard individual medley and the 100 backstroke. He also swam a leg on Breck/Blake’s 200 medley relay, which advanced with the top time in the preliminaries (1:34.60). Winona senior Griffin Wolner, the defending Class 1A champion in the 200 and 500 freestyle, had the top qualifying time in each event on Friday. Wolner’s time of 1:41.16 in the 200 was faster than his winning time (1:41.63) at last year’s state meet. Wolner also swam a leg on Winona’s 200 freestyle and 400 freestyle relay teams, which had the top qualifying times. Alexandria’s Nic Chromey, the only other returning individual champion in Class 1A, had the top qualifying time in the 100 breaststroke. His time of 56.30 was faster than his winning time of last year of 57.34. Sauk Rapids-Rice’s Jack Grabinski, who finished sixth last year, had the top qualifying score (290.55) in the Class 1A diving preliminaries held Thursday. In Class 2A, Prior Lake’s P.J. Lenz, fifth last year, (335.45) had the top score.